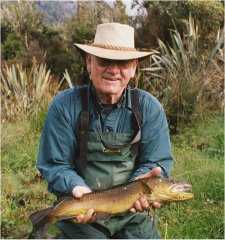 New Zealand angling authors have, over the years, produced an outstanding array of outdoors books and stories, many of which are accessible via the link at top right. I'm in the process of writing a book.. slowly.... and give you a sneak preview in the short strois outlined below.Constructive criticisms are welcomed. The stories here are all true.... in some cases it may have been necessary to change the names to protect the guilty, but seldom the innocent..... 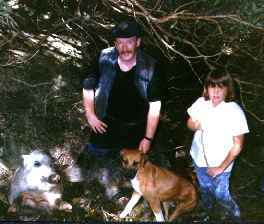 Otherwise, they are a chronicle of events, both happy and sad, over a life time of outdoors experience. Dapper – one who daps… The dapper Mr Norman Hawkins was here on a fishing vacation a few weeks ago. I refer not to his sartorial elegance as, oft-clad in chest waders, this was not so much in evidence. A native of Adin, California, and a youthful, sprightly 70+ years of age, this vacation doubled as a honeymoon for himself and his lovely bride, Bunny. Finding the right boat to assist with our fishing guiding business was not an easy task. So, we did what kiwi's usually do under those circumstances - either make it out of something else, or build it from scratch! 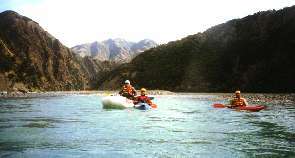 A tale of two kayaking trips down the mighty Clarence River. The first, some 20 years ago, a voyage of survival and shipwreck. The last, only months ago, a voyage of discovery, a four day pleasure cruise. Toby was my friend, and I killed him. My conscience is not clear, and I'd like to share my memories of him with you. I've learned to trust my instincts, and when the urge to hunt descends upon me, I don't ignore it any more. Try two broken legs in one year, when you are 44 years old. Its not so easy to bounce back from, but sometimes the pain and perseverance is worth it. And New Zealand writers, journalists, interviewers, reporters and others - we all had to start somewhere. Hope you like what you found here. Check back from time to time, as more will be added. This influential web site produces a fine newsletter on international fishing destinations, and has an extensive trip report database - check us out there for independent comments on our guiding services, meals and accommodation!